Firefighters learn early in their careers that removing one or more legs of the traditional “fire triangle” will cause a fire to be extinguished. With hoselines and portable fire extinguishers, we learn to use diverse materials (e.g., dry chemical, foam, dry powder, water) that perform one or more of the functions of removing heat, oxygen or fuel from a fire. In the commercial cooking environment, pre-engineered fire protection systems are designed and installed to extinguish fires in a variety of different liquid fuels. 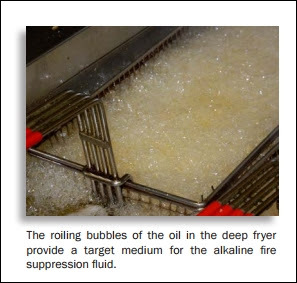 Modern wet chemical suppression systems rely on the interaction with the suppression chemical and the cooking oil to saponify (convert the oils into soapy like substances), resulting in effective fire control and easier post-fire cleanup. Saponification describes the chemical reaction where the animal or vegetable fats are mixed with a strong alkali resulting in soap, water and glycerin. When the fire protection system operates manually or automatically, it introduces the alkali solution that reacts with the fatty acids in the cooking oil. The combination of substances creates a foamy blanket that restricts the release of additional oil vapors and cools the cooking oil surface below its ignition temperature. The Class K extinguisher should be used only after the fire suppression system has operated. Wet chemical fire suppression systems for cooking surfaces have become the modern standard in commercial kitchens. Dry chemical systems, that were popular until the late 1990s, should by now have been phased out, unless they are protecting the cooking fuels and equipment for which they originally were designed and installed. For more information, consider enrolling in the National Fire Academy (NFA) course “Fire Inspection Principles” (R/N0220). Information and applications can be obtained at http://apps.usfa.fema.gov/ nfacourses/catalog/details/47. The course is available at the NFA in Emmitsburg, Maryland, or through your state fire service training agency. CAL FIRE is reopening an old school firefighting tool. 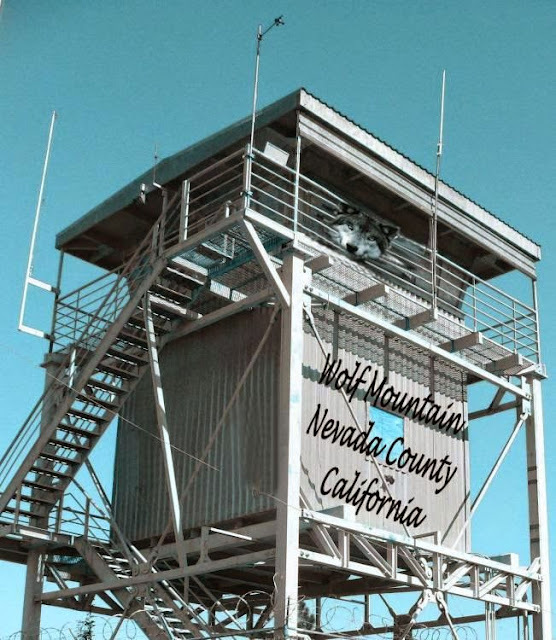 Thanks to a donation of $27,000 from Pacific Gas and Electric, CAL FIRE is able to repair and put back into operation the Wolf Mountain fire tower used by volunteer lookouts to spot wildfires more quickly. The structure had been badly vandalized and was unusable, but grant money is not only restoring the tower but also making the site more secure. Volunteers are needed to man the tower this summer June through October. , so you can call CAL FIRE if you have time and don't mind being alone for long period of time. Wolf Mountain Fire Lookout is located in Nevada County near Grass Valley, California in the Sierra Nevada foothills. HEALTH ADVISORY: Fire impacts northern region Tracy blaze prompts health caution A large biomass fire near Tracy has prompted local air officials to issue a health cautionary statement for the northern counties of San Joaquin, Stanislaus and Merced, particularly the communities of Lathrop, Manteca and Modesto. The caution is in place until the fire is extinguished. Smoke from fires produces fine-particulate matter (PM2.5), which can cause serious health problems including lung disease, asthma attacks, and increased risk of heart attacks and stroke. UPDATE: Piles of wood started that started burning Monday at the Tracy Storage Facility for Agra Marketing of Chico, 20400 S. Tracy Blvd., have sent brown smoke drifting over north Tracy. What: A large biomass fire that’s been burning since Monday near Tracy led air officials to issue a health cautionary statement for San Joaquin, Stanislaus and Merced counties, particularly the communities of Lathrop, Manteca and Modesto. 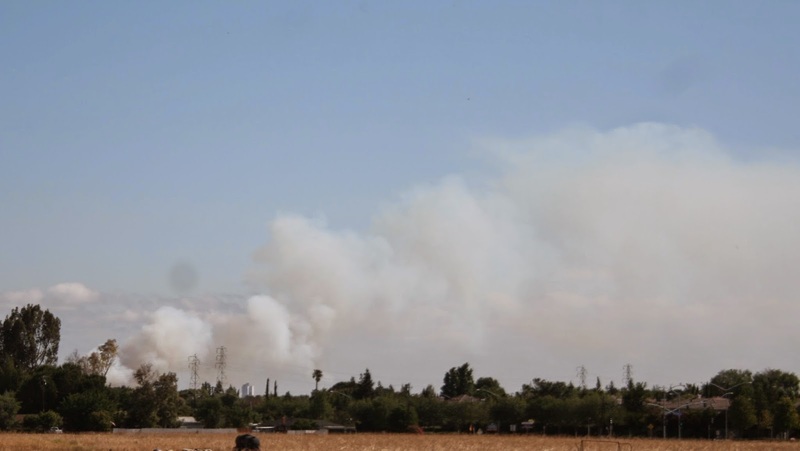 The caution is in place until the fire is extinguished, according to a news release Tuesday from the San Joaquin Valley Air Pollution Control District. A captain with the California Department of Forestry and Fire Protection office in Tracy who had not been on the scene called it a wood chip or debris fire that takes a lot of time, water and foam to put out. Such fires tend to smolder and often require dozers to move around the fuel so hot spots are exposed and extinguished, he said. CBS 13 in Sacramento reported that what’s burning are piles of almond hulls. Location: The fire is in the area of Sugar Road at North Tracy Boulevard, north of Interstate 205. Smoke Health concerns: Smoke from fires produces fine-particulate matter (PM2.5), which can cause serious health problems including lung disease, asthma attacks, and increased risk of heart attacks and stroke, according to the air district. Where conditions warrant, people with heart or lung disease should follow their doctors’ advice for dealing with episodes of particulate exposure. Additionally, older adults and children should avoid prolonged exposure or heavy exertion, depending on their local conditions. People with existing respiratory conditions, young children and elderly people are especially susceptible to health effects from these pollutants. Air district officials urge residents to follow doctors’ orders when exposed to fire emissions. The air district also provides the Real-Time Air Advisory Network, which delivers monitoring data directly to users’ computers. The free service is at www.valleyair.org/raan. School employees who see or smell the smoke near their campuses should keep students inside per the Real-Time Outdoor Activity Risk guidelines for Level 5 conditions at www.valleyair.org/Programs/RAAN/documents/RAAN-AQ-activity-guidance-chart.pdf. For more information, visit www.valleyair.org or call the air district office in Modesto at (209) 557-6400. Los Angeles - The Los Angeles Fire Department (LAFD) has sponsored the high school Fire Instruction Recruitment and Education (FIRE) program since 1999, providing equipment and personnel as needed. The program offers training for high school cadets in firefighting and emergency services; students served by this program change their perspective and their vision for the future. The program currently serves students from the Harbor and Valley area high schools. The Los Angeles Harbor Youth Fire Academy will run from March 21 through May 16, 2015 at Drill Tower 40 in San Pedro. There are 9 local high schools that will be participating in this year’s Fire Academy: Academy Medical Arts, Academy of Educational Empowerment, Banning High School, Carson High School, Harbor Teacher Preparatory, Mary Star High School, Narbonne High School, Rancho Dominquez Preparatory High School, and San Pedro High School. Each student has filled out an application and was hand selected by a counselor. There are over 75 Cadets participating in the Spring 2015 program. To provide students with a career objective, motivating them to complete and excel in high school and continue on to college. To offer a standard curriculum related to a career as a firefighter. To provide classes based upon the LAFD firefighter-training program. To offer students support for success by including faculty from their high schools to serve as trainers and facilitators. To maintain a 50/50 ratio of boys to girls to meet LAFD recruitment goals. The importance of staying in school and continuing on in their education. The real meaning of teamwork and becoming a role model for others. About city government and the chain-of-command in the fire department. Firefighter being fit and strong in mind and body. (Fire Academy Support Team (FAST) Foundation – This board has been in existence for the last four years and recently secured non-profit status from the IRS. Their purpose has been to fund the academy through grants and fundraising efforts. Honda Motor Corporation Foundation – Over the past several years this foundation has provided the FIRE Academy with $125,000 in funding. Los Angeles Fire Foundation – has secured a grant from Motorola, Inc for $60,000 to support the logistical needs of the programs. United Teachers of Los Angeles – because our program works with fully credentialed teachers and counselors from LAUSD we have gained the full support of their union and look forward to their continued support of our students and staff. Currently the FIRE program is offered at 20 different area high schools and has graduated more than 1000 students. This after-school program has won the hearts of the students, their parents and teachers and offers hands-on experience that is truly unique. Kern County, CA - The Bureau of Land Management (BLM), U.S. Forest Service (USFS), Cal Fire and Kern County Fire Department (KCFD) will announce an “Interagency Declaration for the 2015 Wildland Fire Season” at 10 AM on Friday, May 15, 2015. Fire officials, representing all agencies, will make the announcement at the press conference to be held at Kern County Fire Department Headquarters located at 5642 Victor Street, Bakersfield, CA. and SRA (State Response Area) lands protected by the Kern County Fire Department. Fire season officially begins when seasonal firefighting equipment and personnel are in place, prepared, and ready to respond. Homeowners living in the Wildland Urban Interface are reminded to complete their defensible space by clearing hazardous dry vegetation away from their homes, outbuildings and property. State law requires property owners to clear a minimum of 100 feet from any structure. Property clearance for fuels reduction work must be completed by June 15th. If you plan on visiting the Sequoia National Forest or BLM lands, visitors must have a California Campfire Permit in their possession for the use of wood fires, charcoal barbecues, and portable gas stoves using gas, jellied petroleum, or pressurized liquid fuel. These permits are free and can be obtained from any Forest Service, BLM or California Department of Forestry and Fire Protection Office. With the potential for a hot and dry summer ahead, fire officials urge the public to “ Please Be Fire Safe,” when visiting our forests and public lands. Communities need to be prepared! Panorama of the Geronimo Interagency Hotshot Crew (IHC) as they keep watch on their burnout along a forest road. This will help stop the main fire when it comes to this location in the Big Windy Complex, approximately 15 miles west of Interstate 5 and northeast of Galice, OR, on Friday, Aug 9, 2013 in Oregon. The Geronimo Hotshots are from the San Carlos Apache Tribal Natural Resources Program, in San Carlos AZ. Hotshots are highly trained wild land firefighters that normally work in remote locations under arduous conditions. Credit: USDA Photo by Lance Cheung.